The first rule to successful grooming is regularity. If the dog is groomed carefully one or twice a week, he will be clean and attractive and there will rarely be any need to bathe him; bathing can cause numerous problems if done too often. With regular grooming, the dog is also less likely to develop serious mats, which are tedious to remove, damaging to the coat and discouraging, even to the most skilled groomer. The ideal texture of coat is generally described as a "goat's coat" and it is relatively easy to care for. The hair is somewhat coarse, but smooth and should fall naturally into smooth undulating locks with a natural parting on the head, neck and along the back. Unfortunately, not all Briards have the dry, goat's coat and the owner must contend with harsh cowlicks, which fluff up all over the body, or the reverse, a soft, silky coat which frequently develops mats. These problem coats are often found with dogs who are bathed frequently. Bathing strips the coat of its natural oils, softening the texture, it then tangles quickly, tends to be fly-away and is more prone to collect dirt. Of course, the primary source of coat texture is heredity. The Briard has a double coat. The outer coat is long, six or more inches at the shoulder in the adult, and is not inclined to shed. It grows more slowly than the undercoat, once the outer guard hair is broken, cut or pulled out it can be very slow to grow back, especially on the ears and tail. The under coat is softer and only about 3 to 5 inches long and is shed periodically and clings to the long guard hair which is what causes knots. For this reason it is very important to groom your dog regularly, or in time the coat will become matted or even felted. So where do we start? Assuming you have recently acquired your first Briard and assuming he is only a few months old, the younger you start getting him used to the routine the better. A puppy who is not taught this routine in the first three to four months of life, can be difficult to groom as an adult. It is a good idea to teach the puppy to be groomed on a table. If he learns to lie quietly on his side for grooming, the training will have multiple purposes. It will save you the backache, which can come from the bending required to groom the dog on the floor. It will be much easier to trim his toenails and check his ears, and the dog tends to be more quiet when he is up, off the floor also your vet will sincerely appreciate a dog who is trained to sit quietly on a table. You will need a brush, one with strong black bristles on a cushioned base is ideal, and a wide toothed comb, as wide as you can get is best. Avoid using the brush to smack the dog with if he is being a fidget (the temptation is great) as the handles tend to snap off! A firm verbal command is much better and your brush will last longer. Now you have got your puppy used to standing or lying on a table, start with the feet. Brush the coat a small section at a time and keep working on that section until you are satisfied that there are no knots, continue to work up the leg in this way. If you come to any tangles, pull them apart with your fingers to loosen them, starting at the outside of the knot until you reach the skin, then move to another part of the knot and loosen that, follow this with a brushing until there are no snags. Continue up the body taking a section at a time making sure you are brushing down to the skin and not just skimming over the top. For a very stubborn knot or matt, after breaking it up with your fingers, try, with a wide toothed comb, putting the first tooth of the comb into the edge of the knot and pull towards you. Keep doing this from the outside of the knot, working inwards, until you reach the skin. Never insert the comb behind the knot close to the skin and pull. To make it more comfortable for the dog when grooming stubborn knots, hold the knot between your fingers, close to the skin, so that when you pull the coat you are not actually pulling the dog's skin. If you dog is lying on its side it is best to continue to work on this side along his body towards his front. You can actually persuade him to lift up his legs so you can get to his underparts. While the dog is in this position do the inside of the far side legs - paying particular attention around the feet and the dew claws, remembering to check between the toes and pads. When you are satisfied that this side is free from knots and you can take a wide toothed comb through the coat without it getting snagged, persuade you dog to turn over and repeat the process on the other side. Don't forget the coat under the tail and on the back of the legs, particularly a dog around his testicles, as if you allow these parts to get knotted you will have to cut off the knots as, needless to say, a dog is very sensitive around this area. For the front part of the dog, i.e. chest, under the chin and head etc., get the dog in a sitting position and again work from the feet upwards. The part the dog least likes being groomed is his muzzle and beard. This can easily get knotted up due to food getting stuck in the beard. If this is very knotted try to soften the beard with warm water and shampoo and get out as much of the sticky substance as possible first. Don't forget behind the ears, the side of the neck and between the front legs. If you are not showing your dog you could use a comb more but it has a tendency to rip out the coat. Brushing will take much longer but you will end up with more coat on the dog and less in the bin. Briards do vary in the amount of grooming they require, some dogs you can leave for a month and they hardly knot, but others actually need grooming every single day. Ideally a quick brush every day will keep your Briard looking good and knot-free. Between the ages of seven or eight months to twelve or eighteen months of age most Briards shed their soft puppy coat, you will notice that the coat is developing little matts more quickly after grooming. This can accelerate, in some cases, so the pup seems to matt all over, in one day. Serious matting can result if the puppy is not groomed more frequently, it may be necessary to brush the puppy daily. A wire pin brush may help you brush out the dead coat at this point and keep the matts from forming. If you neglect the grooming at this time, both you and your dog will suffer. There is a bright side; once the puppy hair is brushed out and the adult coat develops, grooming will be much easier. The undercoat can cause some grooming problems, some Briards will develop a very heavy undercoat, which can overwhelm the outline of the dog. Rather than thin or trim the coat, which will damage the guard hair, it is wiser to comb out some of the excess undercoat. The areas at the base of the ears, down the sides of the neck and on the throat, over the croup and around the tail need extra attention. Excess undercoat can be combed out or a grooming "rake" can be used. Do not use the type of rake which cuts the coat, the secret is to keep as much of the long outer hair, while removing some of the bulk caused by the overly dense undercoat. The question of whether or not a Briard should be bathed is age-old and time-worn. Many firmly believe that the dog should not be bathed, others believe, just as firmly, that bathing helps make their Briard more beautiful. It is a fact that shampooing strips the natural oils, which actually keep the coat clean when brushed regularly, in addition strong shampoos can irritate the skin; mild shampoos dry it out. The dog's skin does not have the same pH balance as a human's and products designed for people can be harmful. Shampooing also soften the coat causing it to matt; and it can be a week or more before the proper texture returns. Often people will bathe the entire dog when only his feet or whiskers need washing. 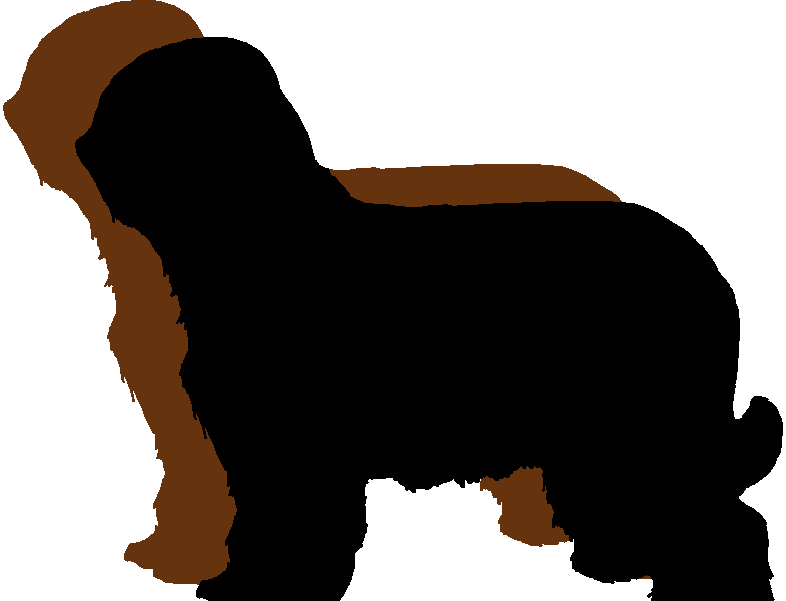 If you must bathe your Briard use a shampoo especially made for dogs, there is quite a selection available at good pet shops and super-markets, while from trade stands at the major dog shows the range seems limitless. (Show dogs must spend a good part of their lives in the bath) The shampoo should be diluted in warm water before it is poured over the wet coat and worked gently through to the skin in the direction the hair grows. Don't rub the hair in every which way as you would do with your own. Leave the head till last since dogs are less inclined to shake and give you a thorough soaking if they have a dry head. Very thorough rinsing is an absolute must. When you are sure that you have rinsed every vestige of shampoo out of the coat, cover your Briard in a large towel and blot as much moisture as you can out of the coat. Briards dry naturally fairly quickly, especially on a warm sunny day, although many show people use a brush and hair dryer to give the dog a quick blow dry. Never bath a dog that is knotted up as the knots will only be worse afterwards, the water has a tendency to make the knots even tighter. Whilst grooming your Briard, remember to check inside his ears and pluck out the dead or excess hair. Ear cleaner is available from your vet or a good pet shop, do not clean beyond where you can see, you should not probe deeply into the ears. A musty odour is a sign of trouble; clean and healthy ears do not have an unpleasant smell. Also periodically check the teeth, if dirty your vet can clean them for you . The brave ones amongst us have a dental tooth scaler and do them ourselves. Before attempting this for the first time, do make sure that your dog will remain still and that someone with experience shows you how to do it. (A scaler is quite sharp and it is quite easy to slip and cut a gum) Nowadays there is doggie tooth paste on the market which is usually available from your veterinary surgery. The other important point to check is claws, especially dewclaws since they do not receive any wear. It is well worth investing in a good pair of dog claw clippers (they are not overly expensive) and clipping claws little and often. This avoids cutting too much off the claw in one go and cutting into the live part and making the claw bleed. If dewclaws are left unattended they can grow round in a circle and actually pierce the skin causing the dog extreme discomfort and risking infection. The grooming written about here is that required to maintain your Briard's coat in a healthy condition. If you are going to show your dog he must be clean, well goomed and, overall, in immaculate condition. Assuming your dog is clean and well groomed the night before a show you are off to a good start. Get to the show early as you have a least a half hours further grooming on that coat. Once your have got yourself settled and your dog installed on his bench, have your cup of coffee and a quick natter to your friends, there is more time for nattering after the judging, then down to business. Brush the dog all over - yes, he will need doing even if he was brushed the night before. Brush the coat upward and then the sides of the coat downwards, make sure that the neck coat is parted and brushed down and that the head coat looks full. If the coat is flyaway, a fine spray of water will help. Watch one of the experts and see how it's done. "First brush against the grain from tail to head and from feet on up; then brush downward. If the dog's hair is too wavy, wet it slightly and brush it flat. If the dog's hair has no body, put an adequate quantity of cut leeks in his soup. If the hair on his paws is rather long, brush the hair up. If he has too much hair on his head and cheeks, use a comb in addition of a brush. Careful grooming hardens the hair. Brush thoroughly in order to massage the skin, circulating the blood and nourishing the roots. When a Briard has a good coat, he does not require more grooming than any other dog. Do not bathe your dog before the show. It will make his hair too fluffy. Bathe him four days before presentation and comb him with great care"
Please fill in your e-mail address for us to contact you.